Remuneration: $88,939.00 (pro rata 0.8) classified under the SCHCADS Award at Employment Level 7. 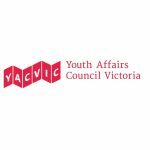 The Policy Manager is responsible for developing YACVic’s policy and responses to government, undertaking relevant research and identifying emerging advocacy issues. The Policy Manager will often represent YACVic at high level meetings focused on policy which may require some travel where necessary. We are looking for someone who is flexible, motivated and willing to play an active part in a collaborative and close-knit team. To be eligible to apply for this position you must be an Australian or New Zealand citizen, permanent resident or hold a valid work permit or visa. YACVic promotes the safety, well-being and inclusion of all children and young people, including those with a disability, those who are Aboriginal or those from refugee or migrant backgrounds. We take child protection very seriously. All employees are subject to screening and assessment against child safety standards, including rigorous background, identity and reference checks. The successful applicant will require a current Working with Children Check and Police Check (costs reimbursed) and must agree to adhere to our child safe policy and code of conduct. Email your application to Stephanie Brenkovich, HR Office Manager at sbrenkovich@yacvic.org.au with Policy Manager in the subject line.